PulSAR: New SSS PREVCO Subsea: New tion took place last December and in- for SAR Operations 15,000 PSI Chamber volved the heavy vessel being lifted by two cranes one, a 97-ton crane and a second, 297-ton crane, one of the larg- est cranes available in the area, maneu- vered the vessel into a vertical position for lifting. The vessel was raised above the building and lowered through a hole in the roof, ? nally coming to rest on a specially designed mounting stand. The PulSAR system is designed to gineering consultancy, specializing in acquire high resolution acoustic images submersible pressure vessels, instru- of the seabed using a compact, rugged mentation housings, junction boxes, stainless steel tow ? sh that is operated pressure relief valves and other subsea with a water protected (IP66) deck unit enclosures and accessories, is increas- and small cable hand reel. The system ing their Pressure testing capabilities. 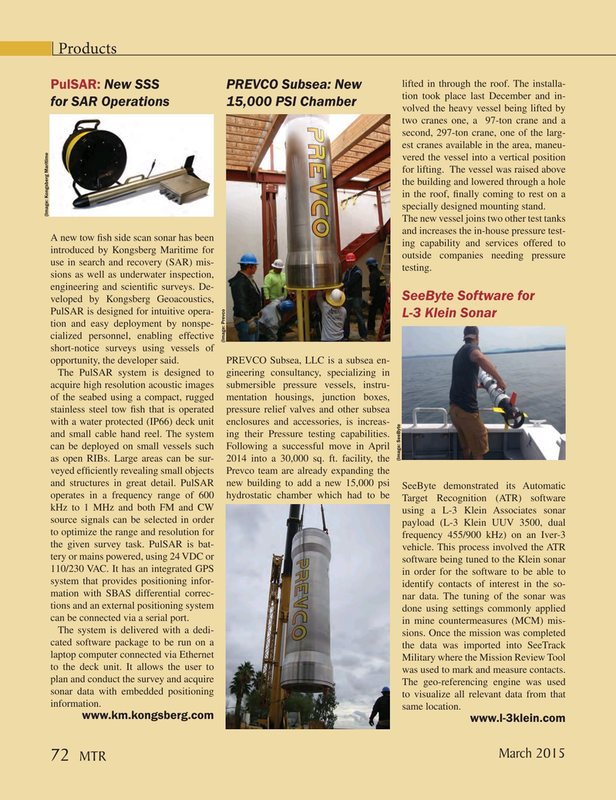 can be deployed on small vessels such Following a successful move in April (Image: SeeByte as open RIBs. Large areas can be sur- 2014 into a 30,000 sq. ft. facility, the veyed ef? ciently revealing small objects Prevco team are already expanding the and structures in great detail. PulSAR new building to add a new 15,000 psi SeeByte demonstrated its Automatic operates in a frequency range of 600 hydrostatic chamber which had to be Target Recognition (ATR) software kHz to 1 MHz and both FM and CW using a L-3 Klein Associates sonar source signals can be selected in order payload (L-3 Klein UUV 3500, dual to optimize the range and resolution for frequency 455/900 kHz) on an Iver-3 the given survey task. PulSAR is bat- vehicle. This process involved the ATR tery or mains powered, using 24 VDC or software being tuned to the Klein sonar 110/230 VAC. It has an integrated GPS in order for the software to be able to system that provides positioning infor- identify contacts of interest in the so- mation with SBAS differential correc- nar data. The tuning of the sonar was tions and an external positioning system done using settings commonly applied can be connected via a serial port.